You are fearfully and wonderfully made! It is so important for us to be the example in loving and embracing our body-shape, no matter our size and proportions. Our bodies are incredible and change so much throughout our lives from travelling around the world, birthing children to pursuing Ministry and Purpose. Athletic – Creative styles work great for you, try our Peplum tops and dresses to add dimension to your style. Inverted triangle – The Knee Length Clergy Dress and Pencil Skirt would be great on you (more sizes coming soon). Hourglass – You will look fabulous in tailored sculptured pieces like the Three Quarter Length Dress and the Gathered Waist Clergy Dresses. Pear shape – We’re bringing you in at your waist, so the Clergy Tea Dress would be perfect for you. Apple shape – Angles work well for you. The Sarah Asymmetric Clergy Top has great complimentary lines, give it a try. 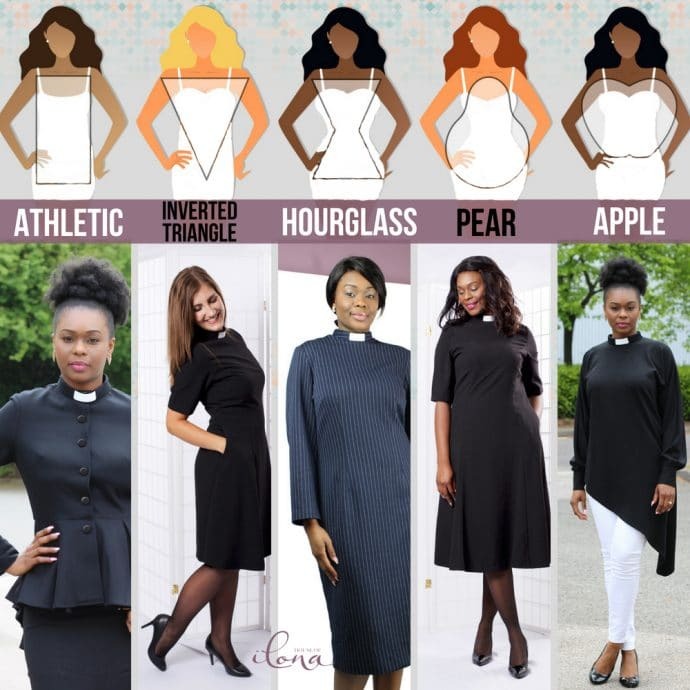 This entry was posted in Blog and tagged @houseofilona, Clergy Attire, Shop Your Shape.